Leave it to Family Guy to point out some of the weird story points from the Star Wars films. For instance which side of the car pilots the Cloud City Cloud Car? Why do the Rebellion wait three years to rescue Han from Jabba? Why does Lando wear Han’s clothes at the end of the film? 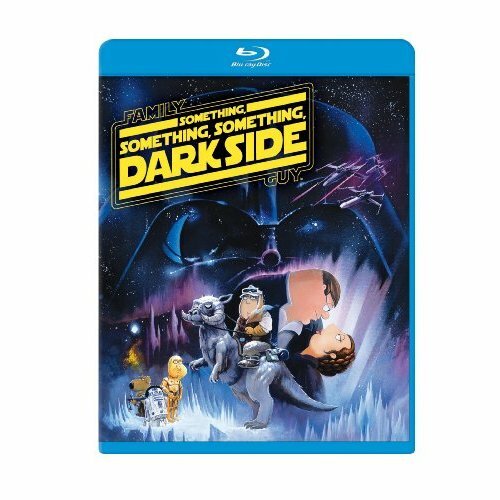 These are just three questions Seth McFarlane asks in the follow-up parody of Blue Harvest, Something, Something, Something, Darkside. 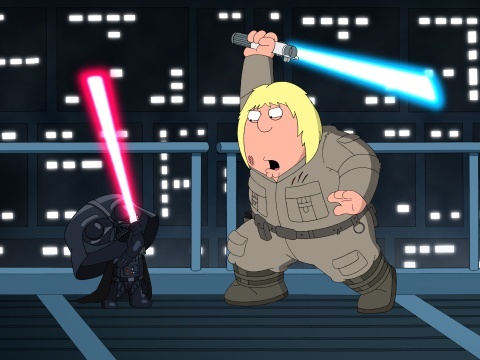 The next installment of the Star Wars parody, has the Family Guy cast reprising their Star Wars roles. Stewie as Darth Vader, Peter as Han, Brian as Chewy, Lois as Leia, Chris as Luke, Quagmire as C3PO and Cleveland as R2D2. This time they expanded the cast to include Carl as Yoda, Mort as Lando Calrissian the “only black guy in the galaxy,” and the Giant Chicken as Boba Fett. Thank God the parody is officially licensed by Lucasfilm. Something Something Something Dark Side would not work without the sound effects and score. It also helps that the film paid attention to all of the details. Seth MacFarlane is obvious a passionate Star Wars fan. The animators recreated scenes frame by frame turning The Empire Strikes Back into 2-dimensional cartoon. The love of the film is obvious. 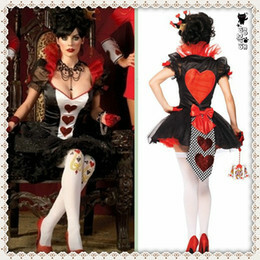 The parody is filled with pop-culture references. The Falcon is a gag from the Wildest Police Chases. Chris as Luke Skywalker trains to the Rocky IV montage, and the ending has a great take from the Back to the Future franchise. In my opinion, Something Something Something Dark Side is far superior to the A New Hope parody Blue Harvest. You may know the story, but the added gags put a new spin on the classic film. I don’t want to ruin any of the jokes for you, so I will keep this review short. If your a fan of Family Guy, then be sure to pick up the DVD. I have watched this twice now, and have caught new things with each viewing. Be sure to watch this soon for the third parody We Have a Bad Feeling About This.